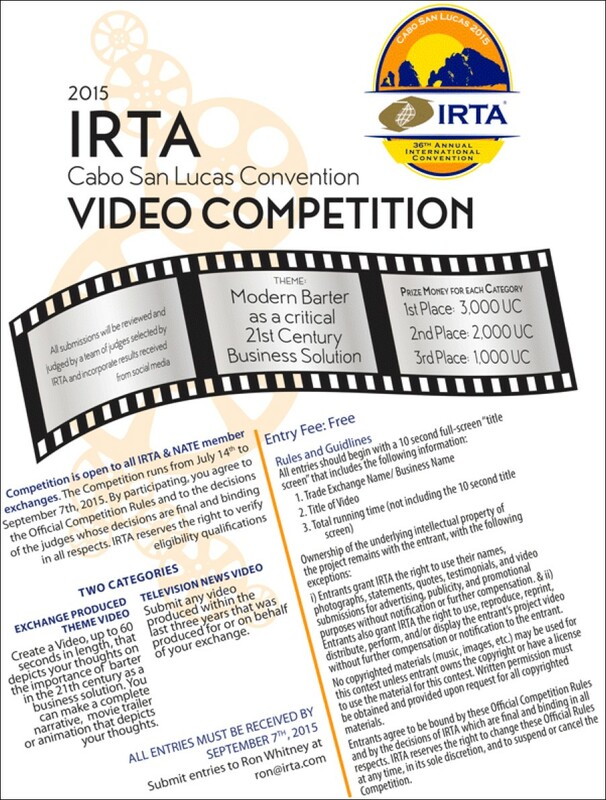 IRTA Video Competition- Check out the rules & the prizes for the best! The Hall of Fame Committee is pleased to announce that Bob Bagga, Co-Founder, President and CEO of BizX with offices in Seattle, Oakland, and Dubai, has been elected to receive the 2015 Hall of Fame Award. This is the highest honor conferred by IRTA, and the association congratulates Bob on his well-deserved award! The award will be presented at the International Reciprocal Trade Association's 36th Annual International Convention being held September 17 through 19 at the Solmar Resort in Cabo San Lucas, Mexico. Bob's accomplishments in the private currency and barter industry have garnered him international recognition. Over the last 20 years, he has built a number of successful trade exchanges. His first company, Barter Business Exchange, which he co-founded at the age of 22, went on to go public as Ubarter.com. He co-founded BizX in 2002, which has grown to be the leading trade exchange on the West Coast. BizX has been recognized by INC Magazine as one of the fastest growing companies in the U.S. for 6 years, and winner of many regional and national awards. In 1992, he co-founded Barter Business Exchange (BBE), which expanded across Canada with offices in Toronto, Hamilton, Windsor, and Vancouver. Rogers Communication, Revlon and Kodak, along with 4,000 other companies were all members of BBE, trading in excess of $60 million a year. BBE went on to become one of Canada's fastest growing companies, and was rated at #46 in 1998 and #51 in 1999 by Profit Magazine. It even went on to be featured by the Canadian Broadcasting Corporation Venture program. In 1999, BBE merged with International Barter Corp to create Ubarter.com, and later that year was acquired by Seattle-based shopnow.com and listed on NASDAQ. Bob has been extensively involved with IRTA, serving on the Board and holding numerous positions, including chairing the certified broker training (CTB) committee, convention committee, Vice President, Treasurer, and a member of the UC committee. He was also a part of the IRTA Board that worked to create the Universal Currency (UC) system, a clearinghouse for trade exchanges that allows exchange members to buy and sell between one another, vastly broadening their reach. In 2005 IRTA recognized Bob's many contributions and accomplishments by giving him the Outstanding Achievement Award and the Legends of Barter Award. Bob is actively involved in the Young Presidents Organization (YPO) and a recipient of the Puget Sound Business Journal’s "40 under 40" award. He lives in Seattle with his wife Anita and children Nikhil, Dylan and Mia. To register for the 2015 IRTA Convention, Click HERE. To review the program schedule for the convention, click HERE. If your barter company's listing on BarterNews.com isn't current, you are definitely missing out on new business. 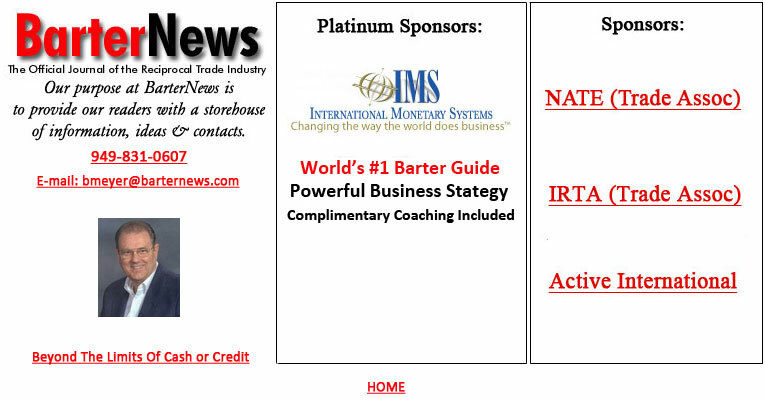 The web site BarterNews.com receives heavy traffic - with over 150,000 page-views every month. Entrepreneurs and corporate executives check the thousands of articles, the weekly "Tuesday Report," and the "Contacts Section" of our site. They use the latter to find barter companies with which to do business. On July 9, 2015, the European Club for Countertrade and Offset (ECCO), was officially notified that it had been accepted as a United Nations Global Compact participant. Submitting once every two years a communication on engagement (COE), similar to the ECCO Social Responsibility Report published in January 2015, that describes ECCO's efforts to support the implementation of the UN Global Compact's ten principles. The UN Global Compact is a corporate responsibility initiative — the world's largest with nearly 12,000 business and non-business participants in more than 140 countries. Following its adhesion, ECCO aims to further align its strategy and operations with universal principles on human rights, labor, environment and anti-corruption, and pursue actions that advance societal goals. Christian Sylvain, chairman of ECCO, stated, "ECCO's participation in the UN Global Compact again demonstrates our steadfast commitment to pursing excellence in offsets through the alignment of the association’s systems, processes, and performance with the world’s highest standards of corporate social responsibility."